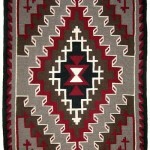 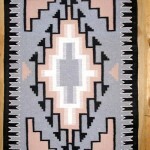 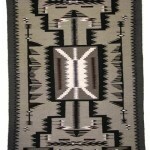 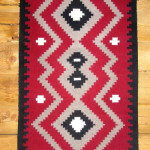 This Zapotec rug resembles the classic Wide Ruins Navajo rug pattern and employs traditional Chief blanket colors of red, black, white and gray. 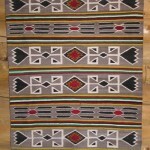 The Navajo Chief Blanket design theme is simple; and may include full or partial diamonds or stepped blocks, serrated zigzags and stripes or bands, and an occasional cross or whirling log. 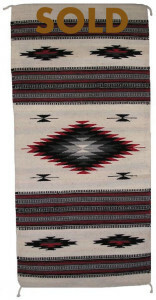 Wide Ruins became visible as a regional style during the Revival Period 1920-1940. 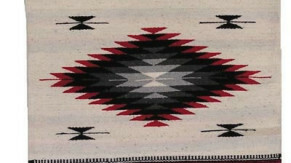 Weavers in the Wide Ruins area make use of banded, unbordered designs reminiscent of Navajo Indian blankets; and colors were derived from all-vegetal dyes.